Kids have been finishing up the school year all across America these last few weeks. But for moms, there is never a break from math, particularly math word problems. That’s right, Moms don’t need to fear the dreaded Summer Brain Drain. Because if they are like me, they’ll be flexing their quantitative skills all summer. For your amusement, and possibly commiseration, I present the following math word problems for moms inspired by my real life. Two parents work outside the home, both from 8am-5pm. One works 7 miles from home, the other works 10 miles from home. Their teenage son needs to attend driver’s education a couple miles from home from 8am-10am for 10 days. Since the son can’t drive himself, who drives the child home at 10am? A tween needs to go to summer camp a couple days a week from 9am-5pm, except for the week she is attending a specialty camp five days in a row from 9am-4pm. Her teenage brother, who does not have a driver’s license, needs to go to high school hockey workouts three days a week in the middle of the day. The same teen needs to attend high school hockey games 20 miles away one night a week and ice times 5 miles away on another night of the week. How should two parents who work outside the home get each kid where on what day and still retain their jobs? A teen is old enough to get a part-time job to earn money and learn responsibility. He is unable to drive. Where can he work that he can get to by walking or biking that also allows him to be gone for his high school hockey workouts three times a week in the middle of the day, his high school hockey games one night a week, and ice times on another night of the week? A mom is tired of figuring out her family’s schedule this summer. A dad is also tired. They never see each other because they are always driving their kids around or working. How many naps, glasses of wine, or carpools that don’t take an arm and a leg to organize will make them happy and not tired again?! 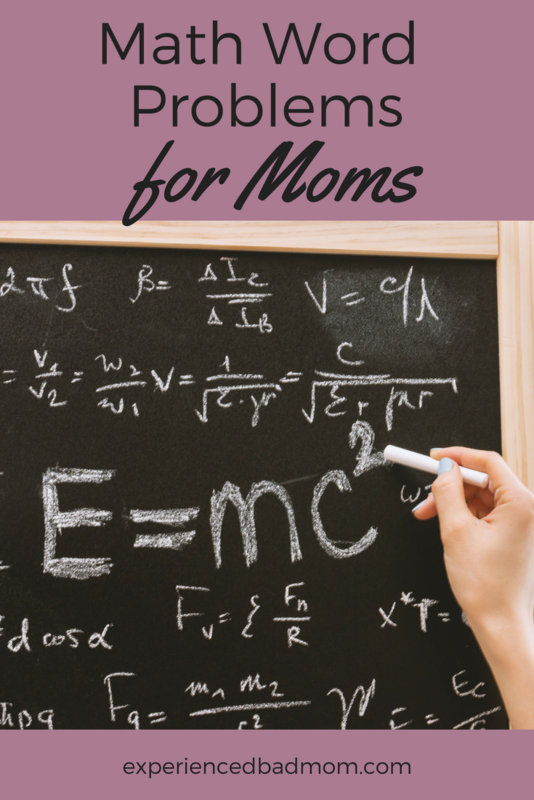 Did you solve these math word problems for moms? Do share the answers. Not only will you get an “A” in life, but you’ll get my undying gratitude. Kelly, I rely on your for help and solutions. I was really hoping for that miracle cure or pill. I bet coming from Canada the pill would be very affordable, too. Well done. I’d try to solve them but I’m too tired. The kids are in bed and I’m not far behind them. You might need a rocket scientist to solve those problems! Ha ha! I once met a dad at my church who literally WAS a rocket scientist. I’m not sure he had any answers, either! Haha! So. Much. Truth. By 9 am this morning, I already struggled with Problem #3, except I have a daughter and it’s cross country conditioning! Thanks for the laugh! You’re welcome! Pretty much every middle school or high school sport has us running our kids around all year, right?! Thanks, Beth! I guess it hearkens back to the days when we all lived on farms and needed our kids to help with the harvest, LOL. Aw, thanks, Nicky! Like all parents everywhere, we’ll just figure it out and do what needs to be done. Somehow! Girllllll!! I SO get this. And btw, this was hilarious and so creative. I keep saying, this is the last chaotic, exhausting, crazy summer we will ever have. And it's true. Hold on! Hang in there! We can do this!